NES Ghosts 'n Goblins (USA) in 10:10.35 by Arc. This 4th attempt (10:15) is 3 seconds faster than the last one and has better form. Theoretically it is probably possible to save a few more seconds, but I don't think I will try any more unless I hear of a way to get under 10 minutes. I changed level 2 a bit and it resulted in a significantly better time for that area. This is also the area where I found the other obscurity. The trick was like Castlevania's floor skipping trick by getting hit. 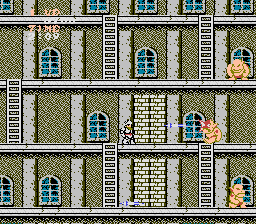 A bat can elevate the knight up one floor, but there was no opportunity to use it in the game, unfortunately.